Preheat oven to 375 F. Coat 12 muffin cups with vegetable cooking spray. In a small saucepan, combine blueberries, orange juice, granulated sugar, cornstarch and orange peel, stirring to dissolve cornstarch. Cook over medium heat, stirring constantly until thick and bubbly (about 3 minutes). Set aside to cool for 10 minutes. Unroll pizza dough onto a lightly floured surface; pat into a 12x9-inch rectangle. 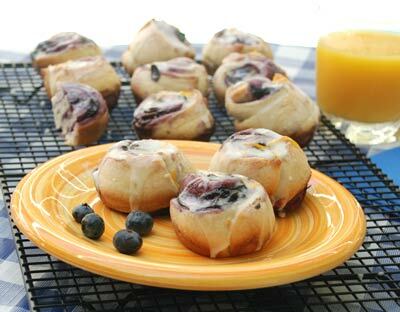 Spread blueberry filling over dough, leaving a 1/2-inch border along the sides. Beginning with the long side, roll up jelly-roll fashion; pinch seam to seal (do not seal ends of roll). Cut roll into 12 1-inch slices. Place slices, cut sides up, in coated muffin cups. Bake 12 to 15 minutes or until lightly browned. Remove rolls from pan; cool on a wire rack for at least 15 minutes before drizzling with glaze. Combine powdered sugar, milk and grated orange peel, stirring until smooth. Drizzle over rolls.